Tortuga is the Island of fishermen, cacti, shells and coral reef. 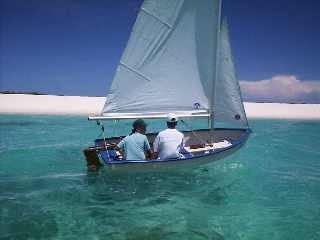 We anchored at Cayo Herradura, It was also the place were I learnt about starfish and pansy shells. There was once a peninsula reaching out into the ocean, but due to a storm it became an island. Clear water laps along the beach while Lee-Ann and I sail up and down in my little sailing dingy. I saw my first batfish here, heaven knows how it got it's name. The fishermen here collect cushion starfish and sell them to tourists as curios. Being an animal lover I could not stand it and whenever they would put a starfish in the boat, I would sneak up on the other side and carefully put them back in the water. We went to five places in the Roques. Sebastopol, El Gran Roque, Crasqui, Isla Carenero and Cayo de Agua. The Roques are a group of islands and reefs about 90 miles off the Venezuelan coast. They are not all that well charted so the feeling of exploration is great. We arrived in Sebastopol on the 22 of September. A wind swept rocky island awaited us, although the scenery was not that great. The water still looked inviting. 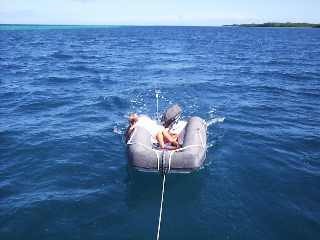 As the anchor hit the bottom I was in mask and fins and not much else. The snorkeling was not great reef wise but the huge Parrotfish made up for the lack of reef. At El Gran Roque the houses are each two tone, and a yellow house will have doorframes that are shocking orange. Shades of different reds, oranges and yellows adorned one house, radiating a sense of heat. The uneven cobbled roads are void of any litter. We only stayed in Crasqui one day, a long beach littered with dead conch shells. In previous years unscrupulous cruisers had used chemicals to catch fish and it bleached the coral, killing it and forcing the fish to move away. The locals come over from Caracas on the weekends to get away. Carenero is a beautiful island has clear water and great snorkeling. There is a four-foot deep underwater island in the middle of the channel. Just to the right is a 20-foot deep channel and to the left a beautiful coral reef. To get into the bay it must be about noon when the sun is overhead so you can see the reef, and all the obstacles in your way. Spear fishing is banned but a hand line is fine. There is no litter on land or in the water, this is because the parks board (Inparques) disposes of garbage twice a week by boat. Feeding frenzies happen regularly so fishing is great. Jack has come to know when the birds all take to the air a feeding frenzy is about to begin. He starts wining and running around the deck until some one comes. There are many parrot, angel and game fish to be seen. The angel fish are quite friendly and come with in arms reach. Parrotfish eat finger coral and you can hear them crunching a few yards away. Meaning island of water, Cayo de Agua is where we decided to go hunting for the once full fresh water wells. If you go ashore get your sandals ready, for burrs cover the island. Jack being a dog did not have shoes and after stepping on a few burrs refused to go a step further. Picking him up I swung him over my neck, and with front paws in my left hand and back paws in my right, he was hitching a ride. Snorkeling on the spit is breathtaking, imagine yourself ten feet underwater, a sheer coral reef cliff face on your right, with sea fans swaying in the imaginary breeze. While to your left, coral reef for about fifty feet then another drop-of going into the depths of the ocean. A family of Queen Trigger fish glides through the coral heads in single file, biggest to smallest. In the shallows hundreds of fins break the water, these are the fins of triggerfish swimming over water too shallow to cover the tops of their fins.